Over the last month and a half, I have been playing a lot of Madden Mobile, the smartphone and tablet-friendly version of the football video game franchise. I describe it as Pokémon for football fans. 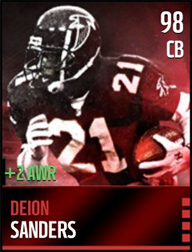 You can’t beat my level 98 Deion Sanders with +2 Awareness! The game allows you to join a league. Being a Miami Dolphins fan, I found a Dolphins fan league and joined up. I don’t know these people all that well, but over the last few weeks, I have been an active league member, playing in league tournaments, chatting with other league members and helping them where I can. I’ve suggested we recruit new active members from a dedicated online community that exists for the game. I’ve also pitched the idea of launching a private Facebook group for league members, so we can better communicate. The league commissioner has encouraged both, and I’ll get to those tasks when I have a chance. I might even register a domain name for the Facebook group, just to make it easy for league members to find and join it. In other words: I’m doing it again. I’m building community. I really believe that, if you are a community builder, you seek to build strong relationships and empower people in whatever group you find yourself in. It’s part of who you are. This isn’t just a job, it’s a calling. Building community is what we do.